One of the strangest phenomenons of the past decade, is the decreasing rates of homelessness across the United States. Despite the housing bubble crash, the devastating recession that followed, and stagnate wages, the number of people living on the streets in America has fallen in recent years. However, this hasn’t been the case across the board. In some cities and states homelessness is rapidly increasing, and the reasons why don’t bode well for our nation’s financial future. Take Los Angeles for instance. A recent study found that 13,000 people in LA County fall into homelessness every month, which is a dramatic increase from previous years. The group’s analysis was based on records for 9 million county residents who received public assistance at any point between 2002 and 2010. The study said many systems, including disability screening, mental health, foster care and criminal justice, fed into the homelessness pipeline. The 2007 to 2010 recession also drove many out of their homes, it said. Several homeless service providers said most of these factors had been discussed anecdotally for years, but the report is the first to capture the scale of the problem and predicted it could have a strong impact. The latest official homeless count found 44,000 people living in county streets in a three-day period in January, a 12% increase in two years. The survey also found a 37% rise in chronically homeless people. But it has long been acknowledged that many more move in and out of homelessness throughout the year. Another great example is San Francisco. After engaging in a 10 year campaign to end homelessness in their city, they still have the same exact number of homeless people that they had before. That may not sound too bad, until you realize that the city established 2’800 housing units for the homeless in that time period. So basically, the homeless rate has only remained flat due to government intervention, and would be significantly higher otherwise. And truth be told, that is the real reason why homeless rates have fallen across the country. It’s not because the economy has supposedly recovered, it’s due to federal assistance programs aimed at helping the homeless. Essentially, local, state, and federal agencies are covering up America’s poverty by throwing tax dollars at the problem, rather than improving the economy and increasing opportunities for these people to survive on their own. This also explains why Los Angeles has a growing homeless problem. 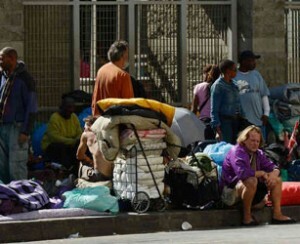 Unlike San Francisco, they have failed to provide enough assistance to the poor. …About 42% of people who fall into homelessness do not receive the help they need to remain stably housed, including employment, health and behavioral health services, case management, disability benefits and subsidized housing, the report said. So now that we know what a city looks like when they can’t or won’t help provide housing to the poor, we have to ask ourselves why these people can’t afford shelter in the first place. You probably already know the answer. They can’t afford to house themselves in part because housing and rental prices are ridiculously high. San Francisco and LA for example, are both on the list of American cities that have had the highest rent increases in recent years. And that is happening because our country is currently witnessing another housing bubble. During the Fed’s quantitative easing program, they spent $1.5 trillion on mortgage-backed securities and have kept interest rates extremely low. Much like the stock market, the Fed has been blowing up the housing market because they claim that higher home prices can improve the economy (in reality, it’s the other way around). So while housing prices soared, home ownership plummeted as everyone scrambled to find an apartment. The price of rent rose, and now there are more people that can’t afford anything at all, and have to take their chances on the streets. In other words, the government is both the cause and the solution to the same problem. The Fed’s monetary policy is driving people into homelessness, while welfare programs are putting them back into homes. It’s a machine that produces nothing but dependents. Meanwhile, America’s debt burden continues to grow to extraordinary levels, and many municipalities are hanging by threadbare budgets. When these institutions can no longer pay for their debts and have to cut services, will they still be able to house the people that they put on the streets? This article was posted in Conspiracy Fact and Theory, Decline, desperation, Economic, Financial, homeless, Monetary and tagged commodities, Federal Reserve. Bookmark the permalink. Follow comments with the RSS feed for this post.Comments are closed, but you can leave a trackback: Trackback URL.